What does is it that makes a man a visionary or a dreamer? How would you define this type of personality and mindset? These type of people often tend to be charismatic leaders that not only command respect from a crowd, but they often tend to be people who are able to uniquely communicate the needs of the individual as well. They also know how to take one person’s dream and translate it into success for all. We are going to take a look at that type of person today as displayed through the life of Yosef haTzadik. and in the eyes of his servants. Our text tell us that this matter (ha-davar) was pleasing (vayitav) in the eyes of Pharaoh and his advisors. But what matter are we speaking of? In this parsha we learn that the Pharaoh had a disturbing dream, but he was not able to understand its significance. The dream and it’s meaning eluded him. Yosef is still in slavery in Egypt, in-fact he is still imprisoned unjustly for a crime he was framed for when he is called up and out of prison to interpret a set of dreams for the ruler of Egypt. He has previously had success with interpreting dreams for some servants of Pharaoh’s, so he is eventually remembered and is turned to as a last resort. Why do I put it that way? It’s because Yosef is certainly the last type of person this king and all his advisors would normally turn to. This is even stated by the Butler who brings up the story of how his dream was amazingly interpreted for him by Yosef. Before the Butler gets too carried away he first has to give the king a few qualifying “buts.” He has to warn Pharaoh about the type of person he is speaking of. Actually, more precisely this butler actually gives Pharaoh the reasons that he would think of dismissing such a person, but he insists that Yosef should be listened to because his words prove to be true. If we think about it, Pharaoh is the most influential man in the known world. His name really needs no explanation, he is king and conqueror over his own impressive empire. Naturally as a ruler of paramount influence he had the most senior and experienced advisors to turn to in all matters. He had the best and wisest men money could buy lining his court. Though when they failed him, Pharaoh’s butler could only recommend that he call on a na’ar – a young man, a boy, a youth. Most often the classical bible translations render this as “lad,” but that doesn’t appropriately relay the meaning of the term. It is true this word is rooted the same as the word no’ar – which clearly means youth. But here this word na’ar comes with all the condescending tones that is similar to snapping one’s fingers and yelling “garçon” (French) or “joven” (Spanish) to a waiter; sure it means “youth,” but it also is a declaration about the other’s status of subservience. The Egyptians identify that their first objection to him is based on his youth. He is a child, to be seen and not heard. Now the next thing that you would think that would be brought up would be the fact that he is a convict and a slave. No, this seems rather easy to dismiss. If we notice here, the fact that he is a convict and for what type of crime is of no concern worth mentioning. Even his slave status is not mentioned until last. He is not just a servant, he is an eved; a slave. What is of more importance to bring up, in order of priority, is that Yosef is an Ivri – he is a Hebrew. Of course we all know how this story ends. Yosef interprets the dream of Pharaoh and is made a regent over all the land of Egypt, second in command to the ruler himself. He is elevated because of the good interpretation of the dream. Pharaoh being convinced that if this wise lad could see what was coming he could also help prevent that disaster. Yet even as Yosef became a man of authority and status, the stigma of being a Hebrew always hung over him. וַיָּשִׂימוּ לוֹ לְבַדּוֹ, וְלָהֶם לְבַדָּם; וְלַמִּצְרִים הָאֹכְלִים אִתּוֹ, לְבַדָּם—כִּי לֹא יוּכְלוּן הַמִּצְרִים לֶאֱכֹל אֶת–הָעִבְרִים לֶחֶם, כִּי–תוֹעֵבָה הִוא לְמִצְרָיִם. Think about this for a moment. Later on in our parsha we read of Yosef in the best light. Where he is really showing off his authority and is at his most ostentatious, as he calls a banquet for his clueless brothers. But notice when the meals are served Yosef sits alone. And his brothers, they dine on their own. We are told why, because Egyptians are not allowed to eat with Hebrews, it is toyveh – it is an abomination, it is detestable to them to eat with Hebrews. One of the points that many seem to miss is that our text also suggest that even the Egyptians on staff for Yosef ate separately from him as well, they ate at the same time but they set out separate place-settings for themselves to the side. There are three sets of place-settings laid out! Even in his role as ruler, Yosef was not socially equal to the Egyptians. To even eat with him, the Egyptians considered that to be against that natural order of their world. This is a long side-track, but it’s important for us to understand the amount of discrimination and the layers of prejudice Yosef had to battle in his lifetime. We just tend to think it all got easy for him once he was raised up as regent, but that’s not so. If this was the case, that Yosef was always under a racial stigma, then why would we suppose that the Egyptians would give such authority to Yosef the Hebrew? Well, as our text reveals the first reason is because the interpretation that Yosef gave to Pharaoh’s dreams was pleasing in their eyes (vayitav hadavar b’einei). It satisfied something in them. And specifically in Pharaoh himself, in a very personal way as well. Now what we need to recognize regarding the revelation that Yosef gave is that Pharaoh did not wait to see if this interpretation proved to be valid. He just accepts it as so. But how can this be? How could a man such a Pharaoh put his trust in seemingly unsubstantiated claims. How could he just trust in this Yosef’s words and advice so? Also we need to notice that Pharaoh just flung the task of governance on Yosef without him even directly asking for it. Notice that Yosef tells Pharaoh to find for himself a man who is “navon u’chacham / who is smart and wise.” Someone that is witty and intelligent. I’m not ssur if Yosef is talking about himself, or is merely just giving the qualifications for the type of man who Pharaoh needs. But he finds himself landing the job. What is it about his message that made Pharaoh value it more than all the words of his advisors? What was it that caught his attention that made him trust Yosef more than even his cabinet? Our rabbis tell us that it was because Yosef’s message resonated with Pharaoh in away that the others didn’t. The Midrash Shechel Tov (12th century) offers us some interesting insights that address these points in its commentary for our two previously mentioned verses (see Midrash Shechel Tov, Genesis 41:37-38). The midrash tells us that when Pharaoh dreamed this up in his head he had also received the interpretation for it. He didn’t just have a dream! He had dreamt of the solution as well, though he had forgotten them both. I think most of us know this type of frustration, to be startled awake by a dream. And having your partner asking you to tell them the dream, but as you try to recount it you realized you forgot your dream. You woke-up knowing what it was about, but now as you try to explain what captured you so the memory begins to fade. And that often becomes more frustrating as one senses there is something just out of grasp in our minds, and then it’s gone again. It’s even more irritating as people try to help you piece it together with things that don’t seem to fit. This seems to be what Pharaoh is experiencing. The midrash tells us that when Pharaoh heard Yosef’s interpretation Pharaoh began to recall his dreams again. He was able to recognize the vision that Yosef was having as being the same as the dreams that Pharaoh had experienced. Our sages and scholars also give us some other interesting insight into this text. The Abarbanel (Don Isaac Abravenel, 15th Century, Spain) also gives us another reason why Yosef’s interpretation was valued over that of Pharaoh’s advisors. The reason they could not interpret his dream was because they saw the two dreams Pharaoh had as independent and separate dreams. But it was only Yosef that was able to pair them together, and thus offer a solution to both. The famed scholars Nechama Leibowitz comments on this point of the Abarbanel, asking us to take notice that when Pharaoh refers to his dreams he speaks of them in the singular. He says “I’ve dreamed a dream,” chalom in the singular. (see Genesis 41:15,17) He seems to know that they are one in the same, they are one dream. And likewise there is only one answer to those dreams. He just feels that they are one in his soul. No answer was pleasing to Pharaoh until a unified solution was offered to him by Yosef. When Yosef is taken out of the prison, cleaned and shaved he was still facing a lot of discrimination against him. They couldn’t fully wash away all the stigma. By the standards of Pharaoh and his men, he was still but “a boy.” Yosef was not exactly the type of person that one would expect to give audience to (probably the reason why the Butler never brought him up), let alone put in a place of authority and leadership for the king. Yet he is still elevated as a leader, all things considered. But even then, he is not transformed into a beltway-boy. He is not ever really accepted into the establishment and upper-crust. He is respected, but not honored with true dignity. They always saw him as different. And he was different. What makes Yosef different from that of Pharaohs men is that he was not just able to deliver a visions of the future, Yosef was able to offer a solution and a plan. While the rest of the men were following after their own separate visions of Pharaoh’s dream, Yosef was already several steps ahead of them in offering a comprehensive answer to it all. He was the first to step out of fantasy and into reality with some sort of suggestion and advice. And that commanded respect, above all the individual speculations of the others in Pharaoh’s court. In the end Pharaoh is forced to concede, and even battle off the objections of his own prejudices and that of his court in saying “Even if we tried, would we ever find another man like this?” Pharaoh himself says that Yosef has a unique character about him, that he has the spirit of G-d in him. That Yosef is blessed with a unique quality of wisdom that only G-d alone can give. He isn’t exactly what they were looking for, but he is the best they can find. He is worth giving a chance to. Do you consider yourself a dreamer? Do you aspire to be a visionary? Maybe you might even consider your ability to be effective and influential in your community to be limited by the prejudices people have against you. You might identify with Yosef in this way. Maybe you are different, because you don’t fit in for some sort of social, ethnic or religious reasons. If so, then you have the example of Yosef going before you as a pioneer of success and strength in the face of lifelong prejudice. The example of Yosef goes before us, challenging us to be people who are more than just smart-talking men. It is also tasking us to be more than mere dreamers as well. Here at this point in Yosef’s life he has matured to being more than a mere dreamer with his own goals in mind, he is now a problem solver and a unifier. He is now able to use his words as more than just tools of gossip and judgmentalism that divide, as in his youth among his brothers when he bombarded them with his self-serving visions. Here he is now able to use his words in a way that resonate with truth for the listener. He was able to take things that were seemingly confounding and contradictory, then unify them as a single goal that everyone could identify with. Even his critics had to concede in the end, that his advice seemed pleasing even in their eyes as well (uve’einei kol-avadav). I wish that more of us were willing to take up these examples from Yosef so that we can also be effective and purposeful people. To be a visionary, and not just a dreamer. People who will be willing to bring unity to our goals of social justice and spiritual harmony. The Midrash Sechel Tov also makes another point of this in its commentary here, hinting at a reason to seek this path of unity and harmony. The midrash suggests that we should operate according to ways that are pleasing to G-d, for when we do that it will show with even our enemies being compelled to be at peace with us as well. (Proverbs 16:7) The sages tell us then even our enemies will become advocates and allies with us. If our vision and spirituality is valid, it will show by compelling unity among us and our enemies. That is an interesting challenge I am willing to take-on. I hope that there are others who are also willing to join me this year in doing the same. The lesson this week is simple. Sometimes the last thing we need is just another smart person in the room. What society really needs is people with a lot of spirit. This week I would like us to ask ourselves a question: Does it matter what language we use when communicating? And even more precisely: Does it matter the type of language we use to communicate a message? This week’s parsha is titled “Devarim / words.” Devarim can also be understood to mean “sayings” or even as “one’s opinions.” It is so titled because Moses is giving us a long speech in order to recount the message of the Torah. We are going to look at how Moses retold this Torah message for the masses of Israelites, all of whom came to hear his final words of advice for them as offered in this book of Deuteronomy. We look to his words because despite Moses’ objections that he was a man without a voice, he is one of the greatest examples of communicating we have to draw from in our tradition. All Torah observant people seek to follow the example of Moshe Rabbeinu (Moses our teacher), as generally his actions are something worth emulating. Moses in this parsha begins to repeat all the teachings and history previously given. However this time he is going to “be’er” the Torah, he is going to explain it to us; he is going to enlighten us regarding the meaning of his teachings. He is going to clarify the meaning of the Torah. How does he go about this? he explained it to them. This small little reference can bring up so many questions for us. Did Moses really speak in seventy languages to the people of Israel, interpreting the Torah for them in these many tongues? If so, why would he need to speak to them in so many languages anyway? And why does it count seventy? Some of these questions can be easily swept aside when we consider the significance of the number seventy. We all recognize that the number seven is a significant number. It is a number that represents completion and wholeness. There are seven days in a week, seven hints at totality and entirety. Seventy is also a number that hints at these same concepts, just on a much higher level. Seventy is an almost exaggerative number that seems to suggest the same form of comprehensiveness and broadness as seven, just much more universal and all-inclusive. I believe it is obvious to us all that the use of the number seventy is to suggest a mystical level of comprehensiveness when we consider where else we have seen the number seventy mentioned elsewhere in our tradition. The first time we are asked to consider the number seventy is early on in Genesis. In the tenth chapter of Genesis the world is going to broken down into three supposed ethnicities; that of Shem, Yafet and Cham; each group named after a son of Noah who they are believed to be derived from. Of these three groups we read of seventy sons being born from these children of Noah. Bnei Noach (“Sons of Noah”) and seventy are thus synonymous in our tradition with the concept of all mankind, the entirety of humanity. Not everyone is Semite (a descent of Shem), and most certainly not everyone is a descendant of Avraham Avinu (“Abraham our Father”); however, we are all children of Noah. But Rashi and our sages are not just of the opinion that this is a statement to the world of G-d’s will for His nation of Israel. They suggest that explaining the Torah in seventy tongues was also intended to help clarify the meaning for the Israelites themselves. To understand why this is also a primary objective of this interpretation, we need to look back to the Rashi for our primary verse. Let’s get back to the starts with Deuteronomy 1:5. Notice that when Rashi explains this interpretation he does not call it a “translation.” No, Rashi instead tells us that Moses uses 70 tongues to “persha lahem,” in order to “explain it to them.” He was interpreting, not necessarily translating for them. It wasn’t merely exported into another language in order to hold it over the heads of the various nations. Instead it was most primarily translated into 70 different forms of speech in order to help interpret it for the Israelites’ benefit. It is true that the Israelites have always tended to speak more than one language, often a Hebraicized variant of the local language. But even if we were to suggest that what is meant by “interpretation” actually means “translation” instead, it seems unlikely that there were more than 70 different dialects of Hebrew language. Surely there weren’t so many dialects that it necessitated Moses translating it into all these tongues for the people to comprehend the message. So what is the meaning of these seventy tongues? Our sages teach us that a lishon is not just a type of language, it is actually a form of speech. A lishon is not just a class of speech, but it is also a mode of speech (example: lishon hara; an evil tongue, understood as symbolic of evil speech). The term lishon can apply to the way we say something, not just the dialect we use. All of us know of the infamous “seventy meanings of interpretation,” as revealed to us in the Midrash. (see Midrash Rabba 13:15) Our religion, at its very core, teaches that we need to be open to more than one interpretation of the text. There are many facets to the Torah, there are many ways that we can look upon the light of this revelation. And from each of our points of view the text can reveal something different, and this is completely acceptable in our tradition. We are asked to look at the text more broadly, and with the input of many suggested views in order to have a more expansive view of the scriptures. We are encouraged to scratch beyond the surface to find new truths each time we learn Torah, a challenge most of us take very seriously. This tradition of interpretation is said to begin with Moses himself, and it continues on with us to this very day. But here in this text the Torah challenges us even further yet. The Torah does not just ask us to find 70 meanings to pass on. No, instead our rabbinic commentaries reveal that we should also seek out 70 ways of communicating the message of Torah. 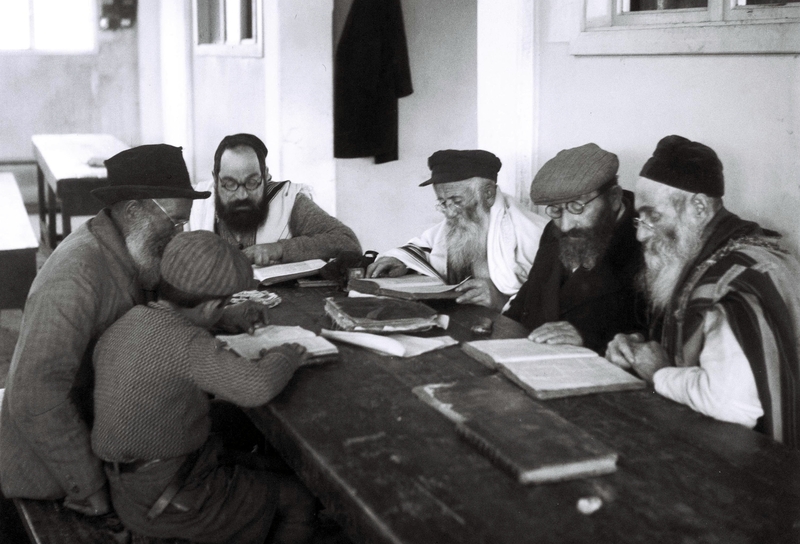 Just as every individual has unique input to communicate as a contribution to our understanding of Torah, likewise each person requires the message of Torah communicated to them in a way that they can best understand. As we embark on our journey through this book of Devarim (Deuteronomy) this year, I hope that we will look at these words with fresh eyes again. Not just to find new and hidden truths, but to also find new ways to communicate the old truths more meaningfully for people. This is the way we follow the example of Moses in helping the Torah speak to people, in a language they understand. Joseph’s Dreams: Dreaming Big, or Too Big? Our parsha is named Vayeshev (and [he] settled), because it begins to tell us of what happened once Jacob settled in the Land. In the previous parsha Jacob had returned home to Hevron, to the home of his father Isaac in Mamre where Abraham has also lived. Isaac died at the age of 180 years and was buried by his sons Jacob and Esau in the Tomb of Machpalah. (35:27-29) Jacob is now the patriarch of the family. However, a great deal this parsha is going to be about Joseph and is not going to necessarily relate to the land of Canaan. This parsha is going to relate how the children of Israel, who is also called Jacob, came to dwell in Egypt. Strangely, though the story beings with the statement “These are the chronicles of Jacob” (v.2), but the first thing it tells us is that Joseph was 17 years old when this story beings. Jacob and Joseph are so intertwined in their love for each other that the story of one cannot be told without the other. Why Do Joseph’s Brothers Hate Him? It’s important for us to understand how things can seem to spiral out of control in this story so quickly regarding the brothers hatred for Joseph. It seems to happen at break-neck speed. But it wasn’t something that happened over night. As we learned in the last parsha, when Esau came and Jacob thought he was going to slaughter them he was sure to put Rachel and Joseph in the furthest and safest spot away from danger, he arranged his household by order of importance to him and Rachel and Joseph were at the top of it. (33:2) This was offensive in cultural terms because Leah was entitled to be the head wife, and here he was showing favoritism to the second wife and her child who was the youngest. This all happened when the children of Jacob (Israel) were small children, but the brothers resented him ever since because of it. Jacob’s apparent love for Rachel and Joseph made them the closest to his heart, but the most reviled among the rest of the family. But it wasn’t necessarily intentional when Jacob seemed to show favoritism. Our text tells us “Now Israel loved Joseph more than all his children, because he was the son of his old age; and he made him a coat of many colors.” (v.3) The contention being made that Joseph was most loved because he was Rachel’s son was not true, in reality Jacob had become an old man and had become a lot more docile in his ways as people often do with age. And being settled in his life he had more time to dedicate to giving attention to Joseph. His act of spoiling Joseph with the flashy outfit was something we would normally see a grandparent doing as apposed to a parent, but we have to understand at this point Jacob is well into his 60’s and that is just his temperament. The only reason he appeared to love Joseph more was because he had more time and resources to devote to Joseph than he did before, like when his other children were young and he was on the road with them. Sadly though, this was not understood and seems to have not been explained to the brothers. The only thing they saw was that their father showed love for this brother more than them, and “velo yachlu dabro leshalom / and they could not speak peaceably to him.” (v.4) Not that they were unwilling, but it was not possible for them to be kind towards him. Had their father tried to explain the difference to them maybe they would have understood and in their hearts could have felt differently. It is very important for people who raise children to not allow oneself to play favorites with any one of our children and to articulate our love for each child. It is important for us to explain to the older children that we have learned from our ways, certainly making mistaking the past, so our ways naturally appear more gentle to the younger children because we have more experience to make better choices. Now before we get too far we need to realize that, like all individuals, Joseph has his own personality defects as well. Joseph seemed to have a big mouth, and had a problem with exaggerating. Basically he was lying to his father through exaggeration. Rashi tells us that when we read “vayave Yosef et-dibatam ra’ah el-avihem / Joseph brought a evil utterances about them to his father” (v.2) that Joseph was of the habit of just mumbling things, like a person does in their sleep almost automatically; he just talks to hear himself talk. And in doing so he ending up exaggerating things about his brothers to his father, which made the situation even worse. So when we come upon the situation of hearing about Joseph’s dreams, the instance that breaks the camel’s back for them, we are told that his brother’s hated him already and they now hated him all the more because of it. Here we have the ever talkative and attention grabbing Joseph saying to them “shime’u-na ha-chalom hazeh asher chalamti / Hear, please, this dream that I have dreamed.” He is clearly beseeching them to listen to him, because they don’t want to have to listen to him yet again. And here is another character flaw that we face here with Joseph. His youthful ambition, his enthusiasm and anxiousness got in the way of his message. We see the other reason they hated him was not just because of the dream that he had, but more so because of the way that he communicated this dream to them. The could not help but become even more incensed by him. When he has his second dream Joseph gets even more annoying. Notice he tells his dream to his brothers in verse 9, and then he tells it again to his father with his brothers present in verse 10. He says that in his dream there were 11 stars that bowed down to him, along with the sun and the moon. It’s not hard to decipher, he has 11 brothers and there were 11 stars. And the symbol of the sun was always associated with the masculine and the moon with the feminine, so it clearly meant his father and mother. When Jacob hears Joseph’s dream we are told “va’yigar-bo aviv / and his his father rebuked him.” (v.10) Because of the dreams Joseph is chastised. Now we should ask ourselves, why should Joseph be castigated regarding his dream? In order to answer that question we need to answer a complicated question first; what is a dream? When Joseph has his first dream about the sheaves his brothers only ask one question: did he really think that he was going to raise himself above them and have authority over them. They wanted to know if Joseph really thought it was possible. But with regard to the second dream his father starts out with a more precise question, “mah ha-chalom ha-zeh asher chalamta / what is this dream that you have dreamed?” (v.10) He wants to know what this dream is supposed to mean to Joseph. But “mah” also can mean how or why as well in many cases. Jacob seems to be asking, even more deeply, how is it that Joseph could let himself dream up such a thing. Why would he allow himself to dream up such a thing. Surely the dream had a lot of chutzpah! Our young and ambitious brother, Joseph, was a person that thought too much and was thus prone to exaggerating in his head. He was a young man who talked to much and thus also had the tendency to exaggerate with his words. When Joseph was done making this spectacle with his dreams we read “vay’kan’u-vu eichav, v’aviv shamar et ha-davar / and his brothers were jealous of him, but his father kept the matter in mind.” (v.11) Kinei, to be jealous is a little bit stronger than it looks on the surface. It means to be worked up to the point one is turning red. It can mean to be provoked to anger because of envy. It can also mean to suspect another of being unfaithful. I also means to be zealous or act as an extremist. How ever we look at it, Joseph’s brothers walk away incensed thinking that he didn’t have concern for anyone but himself. Though Jacob wasn’t so sure if the dream had merit and continued to ponder on the matter. None the less Jacob was right in rebuking Joseph. let him speak my word faithfully. the whole of it is never fulfilled. Whence do we know this? Our Rabbis teach us two lessons about how to deal with dreams based on Joseph’s slip up. The first is suggested to us by Rabbi Yohanan in the name of Rabbi Shimon Bar Yohai, that we need to sort through our dreams and glean what is nourishing from them and the rest of it we need to discard; just like separating wheat from the straw. The second lesson is taught to us by Rabbi Berekiah who suggests that we need to realize that not everything in our dream can necessarily be fulfilled. The example that he gives is that at the time of Joseph’s rise to authority his mother Rachel would not be alive, so his dream only came true in part. Though we can make the majority of our dreams come true through perseverance, some things will be left unfulfilled and we need to accept that. We need to look into our ambitions and separate what has substance from the useless, we need to separate that which is reality from that which is fantasy. 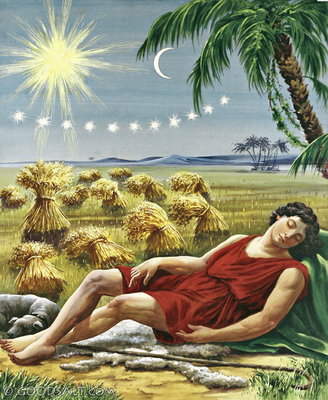 Though Joseph’s dreams were flawed, and even more so his way of communicating it was in error, G-d honored the dream of Joseph and worked with it. G-d did not see fit to destroy Josephs dream. Although it was going to take many years of refinement for Joseph to learn to overcome his aloofness and conform his dream into something that was for the benefit of his people and for the honor of G-d. The way that Joseph was going to receive honor was by first becoming the humblest of servants. The descent of Joseph into Egypt was not only to build him in character, but it was also essential in order to make his dreams come true. He couldn’t not have risen to power in Egypt without first going through the trials of his enslavement that led him there. He would be remembered as being of righteousness memory, yes; but he would also die first before the rest of his brothers (Exodus 1:6, the death of Joseph listed first before that of his brothers). Joseph learned that dreams can come true, but the hard reality of how it comes about is not as effortlessly and glorious as it happens in one’s dreams. His dreams came with consequences and responsibility, ones that complicated and even shorted his life. 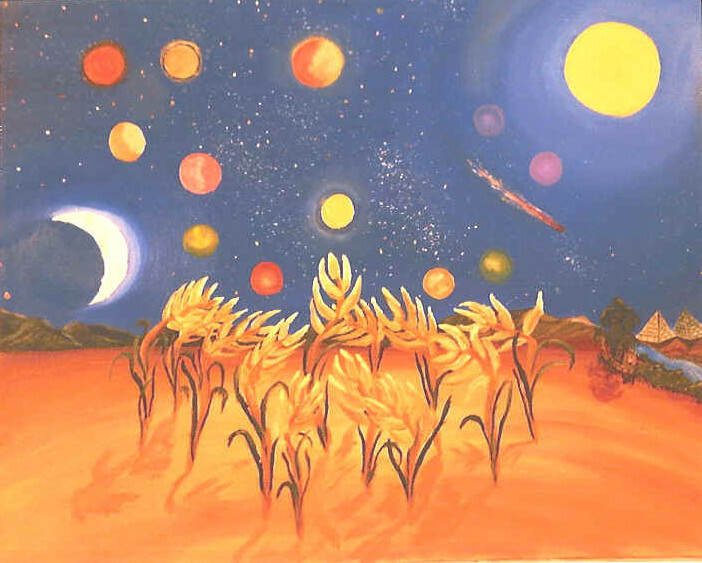 As our parsha progresses, and going into the next parsha, we are going to see the topic of dreams rise again and play a central role in the story. When we read later that the butler and the baker come before Joseph and he offers to help them with an interpretation of their dreams he will not just being to interpret based on his own impulse. He responds with the words, “Do not interpretations belong to G-d? Tell it me, please.” He has come to understanding that he needs to think about that matter and ask G-d for the true meaning. And now he is respectful in the way he relates to others. And later when he comes before Pharaoh, who also asks him to interpret his dream, he responds, “It is not in me, G-d will give Pharaoh an answer of peace.” (41:16) Artscroll also nicely renders it as “That is beyond me, it is G-d Who will respond with Pharaoh’s welfare.” Here Joseph shows that he has learned that in order for him to accomplish what he needs to he must look to G-d for strength because he can’t make it happen all on his own. It’s not all about him. And only once Joseph submits to this level of humility is he able to rise to a place of being truly useful and worthy of honor.